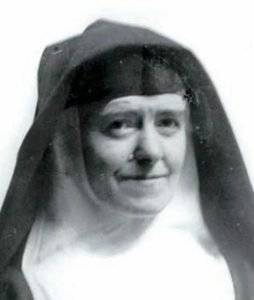 Earlier this week the postulator of the cause of canonization of Leonie Martin –nun of the Order of the Visitation, the daughter of Saints Zelie and Louis Martin, sister of Saint Thérèse, published an update on his recent work. The mortal remains of Sister Leonie was disinterred, given a new habit of the Visitation and placed in a glass coffin. Sister Leonie’s face was face was covered by a mask and work was done to stave-off the further decomposition. It is expected that the body of Sister Leonie will be entomb in the Chapel of the Visitation Monastery. This is a supreme example where we help each other become saints. A significant grace of God! On this blog, and read elsewhere, it is frequently said that saints-beget-saints. How else could you explain how Sister Françoise-Thérèse’s parents and sister are saints and their influence on this member of her biological family? There is a book entitled, 15 Days of Prayer with Leonie Martin. The book is only in French at the moment but this would be the title in English. Let us pray for the canonization of the Servant of God Sister Françoise-Thérèse.